This fairly steep trail with ridgetop views crosses private land and follws old logging roads in several places. 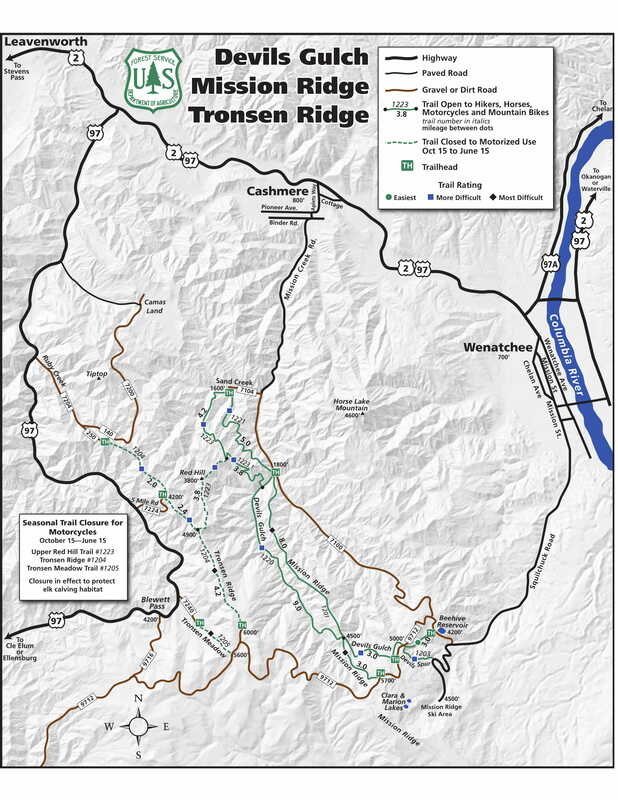 The trail begins at the Red Hill Trailhead located on Sand Creek Road #7104 off of the Mission Creek Road #7100. From Cashmere, WA take the Mission Creek Road south to the edge of pavement. Turn right onto Sand Creek Road #7104 for one mile. The trail begins at the Red Hill Trailhead located on Sand Creek Road #7104. The trail ends at the Devils Gulch ORV Trail #1220.The trail ends at the junction of the Tronson Ridge ORV Trail #1204.